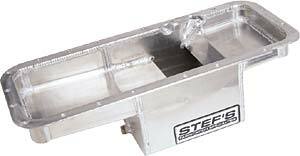 Block fit & leak tested, Stef's Aluminum Oil Pans feature a PTFE-coated unidirectional windage tray and race-proven trap door with baffled sump area for excellent oil control. Pans measure 4-1/2" deep front and 8" deep rear with a 6-quart capacity. Special flywheels or starters are not required for clearance, but check stock pan dimensions as Chevy pans may not fit 1962-67 Chevy II, early Chevelle & Camaro, and Monza V8. All pans include oil pump pickup, magnetic oil drain plug, and mounting hardware; some pans include an oil pump.